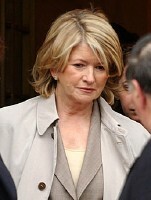 IRATE FANS OF PROGRESSIVE COOKING AND POLITICS were depressed early Tuesday when it was confirmed that, due to routine procedural matters, hopes were growing dim that Lynne Stewart and Martha Stewart would become cellmates. "Given the time it takes to get a convicted felon like Stewart (Lynne) into the system," said Stewart (Martha)'s personal spokeswoman, Nada Pluckit, "we just don't see how we can make it happen before Martha is due to be released and start her television career." Stewart (Lynne)'s personal spokesaman, Ahmad Akbar Finkelstein, was equally despondent: "It is an outrage against Allah, that our helpmate of many years has been denied the right to share up-close incarceration with the doyen of doilies. We were told that a collaboration between the two on book projects, Plastique for Dummies and Mullah Makeovers was a done deal in the high six figures. Again, the Jews of New York crush innocent Muslimites with no outcry from the world. 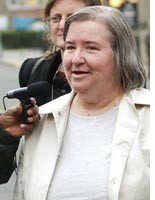 We demand that Lynne Stewart be slammed into Martha Stewart's slammer this instant." In related news, the spokestotem for "The Apprentice" confirmed rumors regarding Stewart (Lynne): "Yes, we have been in discussions with her and have signed a letter of intent to let her star in The Apprentice for the 2035 season."